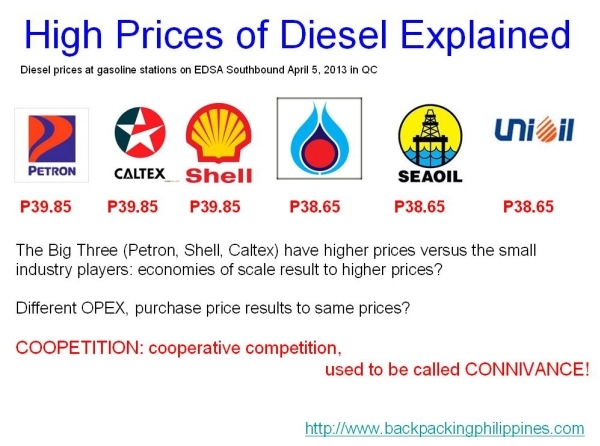 Backpacking Philippines: High Diesel/Gas Prices Make Roadtrips Expensive! High Diesel/Gas Prices Make Roadtrips Expensive! Planning a road trip to a far-away place involves estimating the total distance to be traveled and multiplying this with the cost of fuel per kilometer (which you get by computing the fuel consumption of your vehicle as described below). The high prices of fuel is a burden to commuters and travelers who want to explore places where backpacking (i.e. via public transport) is not easy. As Tutubi gets irked from time to time and wondering why the Oil Deregulation Law is useless but he understands the OPSF was also too burdensome to the government, there must be a way to solve this problem like regulation (and enforcement) against cartels. Do you agree that there's really some "magic" involved here in the Philippines why gas prices are high and the same across the three big oil retailers? Alam na ni Panong yan!